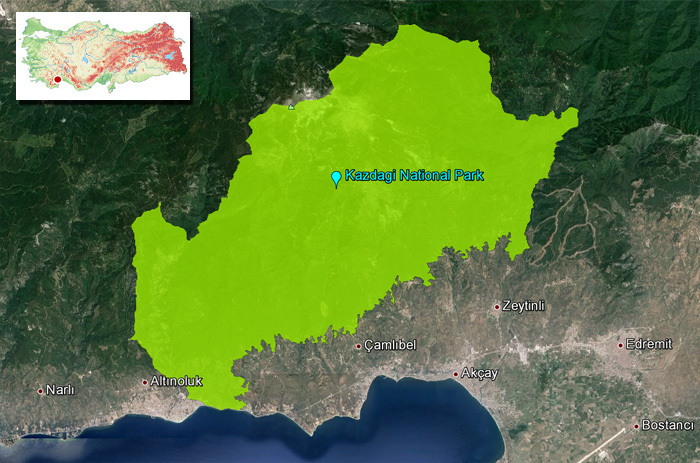 Kazdagi (Mount Ida) National Park is in the district of Edremit, in Balikesir (Balıkesir) province. The National Park can be reached via the 230 highway from Balikesir (92 km), and the 24 highway from Bursa. Kazdagi (Mount Ida) National Park stretches from East to West along the north coast of the Gulf of Edremit at the northern extremity of the Aegean. Kazdagi or Kazdaglari (Kaz mountain), originally called Ida in ancient times, separates the Aegean and Marmara regions and is the highest in the Biga Peninsula at 1.774 m. Places to visit include the valleys with their rich variety of flora and fauna; the mythological Ida Mountain which was said to be the venue of the first beauty contest; and the area of Sarikiz (Sarıkız), in which the Sarikiz myth took place. Mount Ida, the mountain of the Mother Goddess, Cybele, and made it the site of repeated seductions of men by women. Among its slopes and valleys, they insisted, Paris, suckled by a she-bear, went on to make his famous and fateful judgement. And upon its summit, the Gods gathered to watch and decide the resulting battle of Troy. Ida and Troy are world famous and well known places thanks to Homerous, the writer of oldest literary texts. It is stated that Zeus was the referee of Troy wars and he watched the wars from his temple with his wife on the summit. He spent his time with his wife at the magnificent place with lily, saffran and hyacinth. Along the myths of Ida, the well known is the one called first beauty contest in the world. During the Thetis’s wedding, because fight goddess hadnot been invited, he threw a gold apple. Later they could not share the apple so goddnesses colsulted with Zeus. Zeus sent them to Paris, a shepherd in Ida, Afrodite, Hera and Afradit were taken to see Paris with the quidance of hermes. Hermes gave Paris the gold apple. At the same time, goddesses offered bribe. Athena offers intelligence, Hero offered strength and Afrodit offered love but they disnot notice that, it would cause the end of Troy. The ancestors of Romans, Aeneas , was born when Afridite and the handsome shepherd Ankhises loved eachother. He spent his childhood in ida and battled in Troy wars. He was the son of Tros, founder of Troy. One day while he was hunting, Zeus fell in love with him and he was kidnapped by Zeus ‘ Eagle and taken to Olympos. Because he always wanted to see him, Zeus replaced his own daughter with him and he started to serve to gods. Sarikiz and her father lived in a village in Ida .Before her father went on pilgrimage , he had asked his neighbour to look after her when he was away. When he left the village, villagers wanted to get married to her but she refused them all so they calumniated. When her father returned , nodody talked to him. When he asked the reason to his neighbour, he said Sarikiz to went astray and he became sad and thoughtful. Because of his deeply love to his daughter, he could not kill her so left her in Ida with some geese. After a few years , visitors were lost and they said that Sarikiz with her geese helped them. Later when the geese damaged to the fieldsin Bayramiç, villagers informed her about this situation and she built walls by carring stones in her packed. Even today , its remains are visible.when her father heard the news, he went to Ida by hoping she could be his douughter . She arrived and saw her daughter with her geese. They became happy and she showed her respect to her father. He wanted to perform ablution and she helped him . At first the water was salty and she changed salty water with fresh water. He understood that she is a saint. Suddenly he saw black clouds and she dissappeared. He thought that he dissappeared because his secret was divulged. He understood her daughter was columniated so he maledicted to the villagers. While he was walking around , he died and this hill was named Babatepe. Her was burried in Ida . Every year in August , villagers climb to commemorate them. Bayramiç is a special place with its nature and mythology. Ayazma is located 25 km away from Bayramiç and it is a natural wonder. Along the road you can see fruit gardens. Ayazma is an area for picnic and there is an waterfall. The beauty contest, caused to Troy wars,were organised here. Every year in August, the contest is organised. Kazdagi (Mount Ida) National Park covers an area of 21.452 hectares. The area is basically the southern slope of Kazdagi. The highest peak of the mountain is Karatas Hill (Karataş Tepe) 1.774 m. There are more than 10 villages that have been dependent on Kazdagi National Park’s resources for their livelihood . These people together with tourists creates an important impact on the mountain ecosystem and the concern is not different from the general human impacts on mountains. Kazdagi National Park has some 32 endemic species. Some of these species grow in certain small areas and most of these isolated areas located on the upper part of the mountain and especially around Sarıkız peak. These areas are exposed to direct human impact. As for Flora approiximity of 800 plants belonging to 101 families have been identified by the Turkish scientist in Kazdagi National Park so far. 77 of these types can be grown only in Turkey. 29 out of 77 are endemic. On the southern slopes of the mountains up to 200 meters from the sea level, olive trees, about 800 meters pine trees , up to 1.500 metres larches and beaches can be grown as naturally. Endemic plants can be seen over 1.550 mteres on the mountains. Kazdagi (Mount Ida) forms the natural border between the provinces of Canakkale (Çanakkale) and Balikesir (Balıkesir) in northwestern Turkey. Kazdagi (Mount Ida) was declared a National Park in 1994 because of its rich plant cover. There are three vegetation types on Kazdagi; forest vegetation, shrub vegetation and high mountain vegetation. There are 800 plant taxa recorded on Kazdagi. 198 of them are of particular ethnobotanical significance for this mountain. Kazdagi is accepted as one of the most important floristic areas of Turkey. Besides the coastal and mountain scenery and the villages tumbling down their slopes, the Kazdagi (Kaz mountains) are renowned for the high oxygen content of the air. The U-shaped Sahin River (Şahin Deresi) canyon (Hawk Valley), some 600 m in height, 700 m in breadth and 27 km in length, acts as an effective chimney, casting the pine-scented air of the highlands out over the gulf, and drawing the iodised sea air back up into the mountains. It is an ideal climate for those who suffer from asthma, bronchitis or infections of the respiratory tract. The region has become a magnet for mountaineers, hikers and other friends of the outdoors. Visitors can also trace the origins of more recent, rural civilisations. The villages of Çamlıbel (Pine Ridge), Pınarbaşı (Spring-side), Beyoba (Pince’s camp) and Mehmetalan all are to be encountered along a single horizontal route which combines the freshness of nature with a glimpse of traditional lifestyles. For those who can’t do without the sea, it’s nearby, and it’s beautiful. The coast between Kucukkuyu (Küçükkuyu) and Edremit is highly developed, but between Kucukkuyu and Assos lies one of Turkey’s most delightful swimming seas, and it’s clean, calm, and refreshing. Most of the good village hotels have their own private beach somewhere on this route. Alternatively, since the whole of the coast is a protected area, you can park your car among the olive trees almost anywhere along the coast road and jump in there may not be a sandy beach, but you might feel like you’re the first to swim in that exact spot. If you’d rather have the sand, Kadirga (Kadırga) Beach is on the same coast closer to Assos. Beaches and camp-sites can be found nearby, while the thermal waters of Gure (Güre) as well as Balikesir’s springs offer another healthy and leisurely option.